We as organizers of Moscow Ski&Board Salon keep moving on. We see our mission in supporting not only the development of the mountain industry in this country but also in supporting the sports industry in general. We are happy to note that FIFA-2018 gives a great impact to the sports infrastructure in many of the Russian cities. We hope that these changes will go a long way in involving the local people not only with soccer but with sports in general. However, the current tasks do not just come down to building up date stadiums. These stadiums need to be effectively operated in the future. Their operation must be efficient and it must be profitable, which is not a trivial task. We see our goal in creating - on the basis of these new stadiums - all-season sports centers that are effectively loaded, bring in steady revenue streams, and satisfy the desire of our countrymen to go in for different kind of sports. This opens up boundless opportunities for private and public initiative and entrepreneurship. We are sure that the experience that you accumulated can be used for solving these tasks, while you will get an opportunity to successfully develop your business in new directions. A modern sports center is not just about a sports field but also sports facilities, gyms, and venues for various kinds of sports, gear rental points, admission systems, sports goods stores, organization of interesting events (not necessarily sports ones), equipped sports parks, and many other things, which constitute the basis of your business. 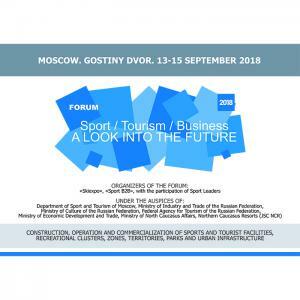 Within the framework of Moscow Ski&Board Salon and the "Skiing Russia" Forum, we are continuing to create the conditions for effective exchange of best practices in the construction, operation, marketing, and commercialization of the Russian skiing industry. From the marketing standpoint, the organization of any trade show or industry forum gives its members an opportunity for uniting the audiences of their potential partners and buyers without losing their uniqueness, as well as re-establishing themselves on the market and attract customers from a new, and sometimes unexpected side. With this purpose in mind, we are offering you a new joint project, the presentation of which will be sent to you on request.